Sen. Chuck Grassley (R-IA) on Sunday slammed Democrats for "withholding information" in relation to the sexual assault allegations against Judge Brett Kavanaugh. According to Grassley, the Senate Judiciary Committee is attempting to investigate Dr. Christine Blasey Ford and Deborah Ramirez's allegations, The Hill reported. 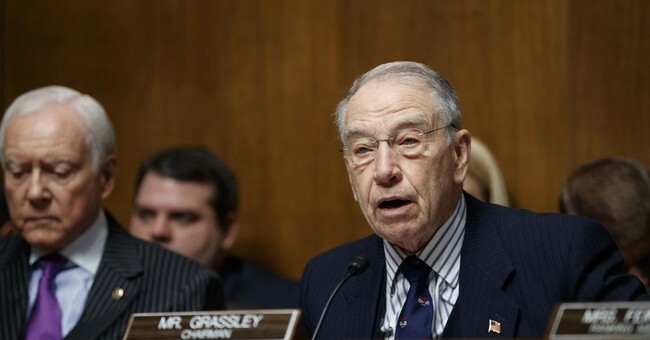 "Yet again, Senate Democrats actively withheld information from the rest of the Committee only to drop information at politically opportune moments," Grassley said in a statement. Grassley previously blamed the Left for withholding documents relating to Dr. Ford's alleged assault. Sen. Dianne Feinstein (D-CA) originally received Ford's letter on July 30. Feinstein kept the allegations quiet for six weeks before Ford went public last week. According to Grassley Democrats are "more interested in a political takedown" instead of "pursuing allegations through a bipartisan and professional" investigation. Democrats accused the GOP of attempting to push the Kavanaugh confirmation hearings forward last week because they knew The New Yorker would be releasing a story with Deborah Ramirez's allegations against Kavanaugh. "The committee’s majority staff learned the allegations made by Deborah Ramirez about Judge Kavanaugh from this evening’s New Yorker report," Grassley said. "Neither she nor her legal representative have contacted the chairman’s office. The article reports that Democratic staff were aware of these allegations, but they never informed Republican staff."